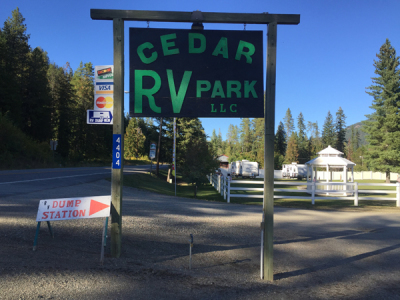 Gabe and Linda Osbourn invite you to come enjoy their beautiful RV park and gracious hospitality. You'll appreciate the immaculate grounds and sparkling clean bathrooms. Their sites are nestled among green grass and beautiful cedar trees in the northeastern Washington town on Ione. They offer 20, 30, and 50 amp full hook-ups, cable tv, Wi-Fi, showers, laundry facilities, a car wash, and a gift shop that offers unique and hand-crafted items. In addition, their gift shop offers a huge variety of RV supplies, parts & accessories. They are located 20 miles south of the Canadian border, and welcome families, groups and clubs. Their location is within walking distance to downtown Ione shops, the town park, and the beautiful Pend Oreille River. Bring your boat and Bring your boat and watercrafts, which can be launched at the Town Park, just a few blocks away. North Pend Oreille country offers year-round activities and events for the whole family. You can enjoy hunting, fishing, cross country and water skiing, boating, hiking, and community events. You will love the ORV-friendly town of Ione and its neighborly people. Come and meet Gabe & Linda! You'll be glad you did!